you had your first official shift last night. i tried to stay awake until after closing, so i could call you and see how it all panned out after we last spoke, at the beginning of the shift, when the hum of the television and friends could be heard in the background, behind your nervous and hopeful voice. with only four hours of sleep from the night before in my reserve, however, i fell fast asleep around 9. fighting a bossy cold. i texted you as soon as the weight of impending slumber tugged at my eyelids. i woke at 12:22 for a few seconds. thought of you. wondered if you had closed or were staying open until 1. fleeting thoughts. fast asleep soon thereafter. i woke to a quiet house save the television. bumbled around our home. acknowledged the strangeness of leaving lights on and prepping for the day without care of the sounds such kitchen fumbles made. usually, while you sleep through my morning routine, there's no illumination. unmatched socks and spots of bread mold have been the results of such timid morning practices. not so today. i tell you how i've started a separate blog to detail this new life. you laugh at that. we soon end the conversation. you promise to send photos of the progress. i assure you that you are only two days in. it'll get better once the old sign is down and ours is launched. when we put trees out front. when we stay open to certain times each night. become reliable for patrons. i'll launch a facebook page. handle the marketing. get the word out. just before we hang up you say, it's all for us. that you'd never put yourself through all of this just for you. i laugh at this, knowing that if you were still single, you would be leading a different life. you'd have no reason to return to the town of your roots. you wouldn't own a house there in preparation for our family. 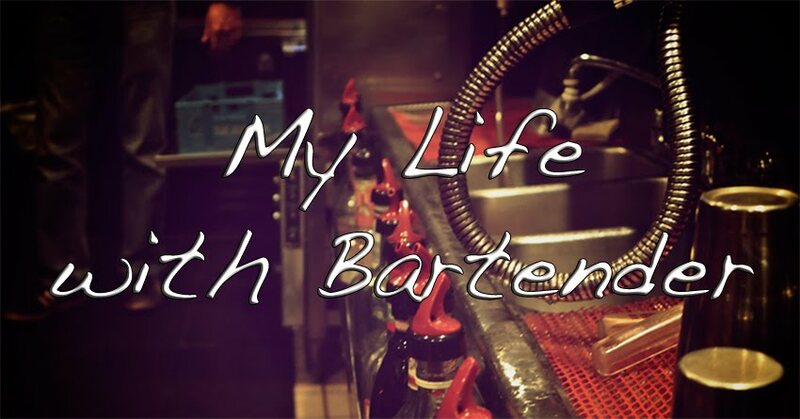 you'd most likely be living that bartender life. you know, the typical one. the one you strayed from after i walked into the barroom. i'm both elated and guilty. the level of stress you endure wears upon you in the silver strands breaking through your dark locks and beard. you wear it well, my dear. and, i hope you don't resent it. i hope the surprise of this new path enlivens you once it's all set in place. i truly hope it's all that you want. i'm writing on this hazy tuesday morning with an equally hazy mind. we've had quite a run of it the past few days and i believe it's now catching up with me. you worked until 6:00 in the morning friday night through saturday so you could make some pocket change building a takeout window at the cambridge bar. i woke a tad early on saturday with many chores in mind that i kept at bay until the hour you woke. the lack of sleep. the worry of what was ahead for us on monday. it was all showing in the puffy lines on your tired face. my poor man. i poured you a glass of juice instructing you to get some nutrients. you left to meet with the guy who rents the pool table and other "amusements" at the bar soon to be ours. i took care of housekeeping to be sure all was in order in our home before i left. tangible cleaning/sorting eases my mind. we spent saturday night with our friends decked out in a psuedo preppy best for halloween shenanigans. then sunday we met with our attorney. he had the financials spelled out. he had a problem. a large problem it turned out. we worried that the deal would take more time. again. then, monday finally arrived. you didn't want to wake to meet with the current owners to count their inventory. apparently they didn't either. "let's just call it an even exchange." we agree. you return to bed for a snooze before the hour arrives. when i wake you, you ask if we can just not go. i don't want to be without you, you admit. can't we just stay in bed and snuggle. you are not one to snuggle. although a grand idea, i don't allow for this avoidance. get up. this is the moment you've worked towards. for a decade. let's jump in. paperwork, close to a foot thick, makes everything final. the issue of the day previous is muted, not gone, but not as costly. you rest your hand on my leg. you're warm, sweaty even. nervous. i hold your hand, patting with reassurance. when we're asked for our licenses, you shuffle your wallet around and sneak a glance at a note i wrote to you on friday morning. you nod at it - keeping it close it seems. this small gesture makes me happy. those simple words do make a difference. the attorneys wonder about the name of the llc. you explain that it references our pup. the closing attorney says that anyone who names something after their pet is good in her book. talk of our dogs is filler between the itemized list. five pages long. two-and-a-half hours later, we are outside again. congratulations in our wake. we stare blankly at each other. we do not grasp what we've done. we kid that we don't even know where the light switch is in the bar. we decide to open a p.o. box. then, standing in the post office parking lot, you say, let's just go to city hall now. we're in it. why not go and make it really official. i entertain the idea for the rest of the afternoon. instead of going straight to the bar, we visit our soon-to-be bartender and always friend across the street at the bar she is currently at. she raises her arms in paused cheer until we smile and say YES. we are here to check out the competition. the day regulars cheers with us a celebratory shot. it's blue and fruity. we munch on warm flat bread 'wiches from across the way. mustering up a slight buzz to relieve us of the morning's stress as well as fuel a calm enough to visit our new endeavor. hours later, we are there, light switches in place illuminating a room filled with friends helping paint away the dirty nicotine white walls with a bright, energizing, warm red. i learn the register with the help of perrya. she kicks into gear making drinks, wiping the coolers, washing glasses. attention to upkeep an indication of how she's waited, like us, for this moment. she's invested somehow too. hilarious dancing ensues. we marvel at our new identities as "the owners." we close at midnight. cash out. yeah! turn off the lights. perrya hugs us outside. seems to abound with excitement. i love you guys. she's not one to say such admissions. all of us are tired but aglow. i worry about when to return to the city. vow to sleep for a few hours then drive back when it's still dark. you cuddle up to me. this arrangement also new. but, we need this closeness. soon i'll be back in the city, somehow returning to normal when everything is but that. a deer's shape and glowing eyes will wonder from the road what i'm doing driving at this hour. it's the hour of deer grazing in our area. not of people driving. the road is vacant save for truckers and a few suvs. i try to maintain my usual granny driving but am impatient to return home for more sleep. my throat is scratchy and aids in a raspy singing voice. sing a duet with bonnie raitt. relish the talking heads and ben folds five. scan until i hear jim morrison, your favorite. then, grow teary eyed when the neil young song i want to play at our wedding fills the speakers. i haven't yet mentioned this song to you. yet, every time i hear it, my eyes are wet with the visualization of us dancing at our wedding. of you surprised by my song pick but singing the words into my ear. because i just know it must be familiar to you. the city still rests beneath a dark sky when i return. the skyline still lit as if in night. i grasp at an hour or so more of sleep then ready for work in our quiet abode. is this how it shall be now? separate? i try not to ponder. i grow weary the closer i maneuver my car to the office. i can't do this much longer, i admit. now that we've made this first step possible, i need to continue. what dream of mine may i bring to fruition now? i relate the goings on to my office friends. by the fifth retelling, my throat is scratchy. you phone me just to hear my voice. share that the newness/nerves haven't worn off from a night's rest. you want me there with you. me too, sweetheart. we console each other with mention of the day's plans. with comforts of mention that we'll be together at the end of the week. that somehow, we'll make it so we don't have to be apart. and, just like that, through a pile of paperwork, our days and nights are changed. i'm no longer simply a bartender's lady. i'm now an owner. serving a supporting role to yours. and, somehow, it feels like something i was meant to do. Four days from now, we'll be in the thick of the planning. Tearing down a ceiling. Tearing up a carpet. Laying down wooden flooring. It's going to be a big, dirty job. And, when all is in place and dusted off, we will have a bar. A bar! What's wrong? Why so down? You ask. I'm bored. Tired. And, frankly, let down. Telecommuting options for work do not seem possible. I want to split the time with you between Poi and the city. I don't want to broaden our opposite schedules. I don't want to be alone THAT much. Yet, I do not have an option. I will remain working in the city and you will be working and living most of the week 60 miles away. The glow lasted 24 hours. Almost exactly. Now, I'm simply worried. Fret about the negative repercussions. See the week ahead of you not really including my help. I have to wonder now, if all my musings about my role were just a fantasy. Am I going to be living by myself all week? What will be the point of that? But, I chalk my tone up to tiredness (true) and boredom (true, true) because these are things I know to be true at this moment. All other worry, notions, wonderment are just that. For now. After the ups and downs since April, I've learned to feel the emotions but to not allow them to take over because they evaporate tomorrow when another course of events takes us on yet another path. Falls in love with The Bartender. jennifer j. adams. Awesome Inc. theme. Powered by Blogger.